Our office will be closed this Friday, April 19th in observance of Good Friday. We hope everyone has a blessed Easter weekend! It’s time for a digital spring cleaning! Don’t Fall for this Phishing Scam! 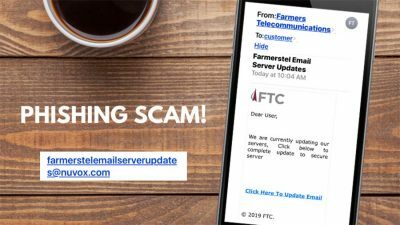 If you have received an email from farmerstelemailserverupdates.nuvox.com asking you to update your email, please be aware that this is an email PHISHING SCAM and not a legitimate email from Farmers Telecommunications Cooperative. For more information on what precautions you should take regarding phishing scams please visit the Federal Trade Commission website. Rates are increasing. Here are the facts. Please note that on November 1, the FTCtv channel numbers will change. 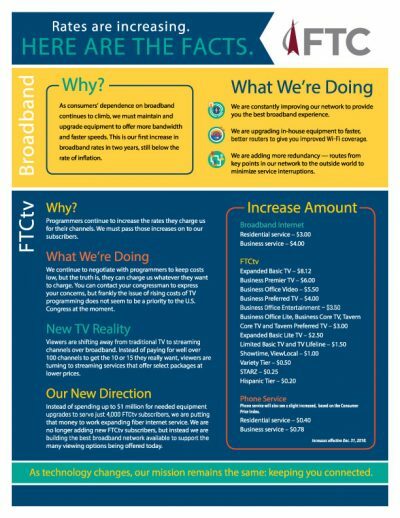 FTCtv will be replacing any Standard Definition (SD) channel with a High Definition (HD) channel that is currently available in our lineup. FTCtv will no longer include the 1,000 + channel numbers, which are duplicated HD channels. Keep up with everything going on at FTC with our social media channels. 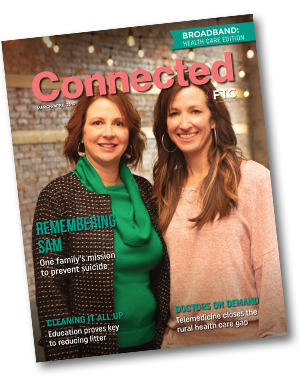 Read issues of Connected online with stories from your neighbors in the FTC Community. In this issue, read about a local family’s mission to prevent suicide.